This 10-day driving itinerary is a wonderful and relaxed way of exploring the Cape Town, Winelands & Hermanus areas. The short driving distances between destinations mean that you sit back and enjoy the diverse landscapes, whilst being treated to the best that wine & whales have to offer. Your holiday will start with 4 nights in Cape Town, where you’ll be staying at a guest house nestled at the foot of Table Mountain and offering views of the mountain and city. Here you are in prime location for exploring the ‘Mother City’. Cape Town has so much to offer, from hikes up Table Mountain or Lions Head, to beautiful scenic morning drives along the coastline to visit the penguins in Simon’s Town, perhaps stopping off at the Hout Bay market for a delicious late lunch on the way back. There are also an abundance of unique restaurants dotted around the city and the Atlantic Seaboard that are definitely worth visiting. From Cape Town you will head off along the spectacular coastline to Hermanus, to start off the “whales” part of your wine & whales holiday. Between June and November, the Southern Right Whales come into the bay at Hermanus to calf, making this a very popular and exciting time for visiting the area. 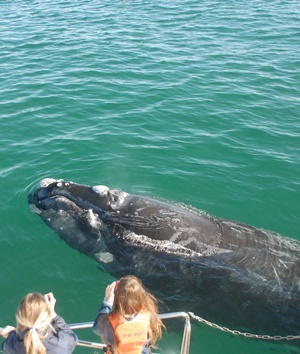 Hermanus offers ample whale sighting opportunities from the land, but your stay here will also include a boat trip so you can get a closer look at these awe-inspiring gentle giants of the sea. Following your stay in Hermanus, you will head off inland towards Swellendam. 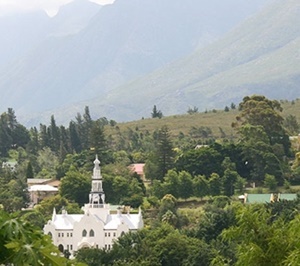 Being the third oldest town in South Africa, Swellendam has a rich history, and still retains a country atmosphere. You’ll spend 1 night staying in the historical part of the town, at an owner run guest house, where you’ll be perfectly situated to take a stroll to some of the finest restaurants the town has to offer. The last leg of your wine & whales holiday brings you along route 62, the world’s longest wine route, to the Franschhoek Wine Valley. You’ll be staying in the heart of the Franschhoek village, strolling distance to many great restaurants, you might struggle to choose which ones to visit. 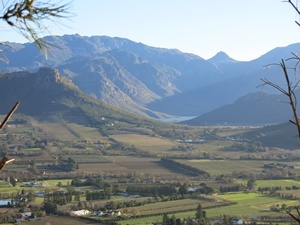 We recommend taking the Franschhoek Tram to visit some of the nearby wine farms – a super way to get around and explore this beautiful area, while spending the evenings eating out in South Africa’s culinary capital. Now if you don’t have as much time, why not just sneak in a weekend away – either as a decadent escape from London (its only 12 hours away…) or as an add-on to a holiday in Cape Town. We have put together an example here of how you can indulge in whale of a weekend! Arrival at Cape Town International and collect your hire car, travelling an easy 30 minutes to the city where you will be based for the next 4 nights. 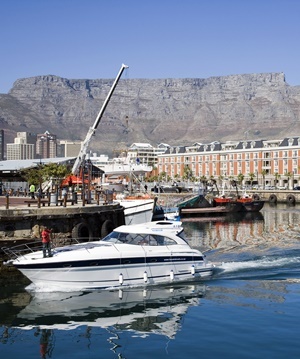 Spend a day exploring the Cape Peninsula – visiting Cape Point and the penguins, take the cable-car up to the top of Table Mountain (or hike), stroll the V&A Waterfront with its many restaurants and hop on the ferry to Robben Island for an interesting tour about Nelson Mandela’s prison days. You stay at Floreal House, a cosy guest house on the slopes of the mountain (breakfast included). After breakfast take the beautiful coastal drive to Hermanus where you will be staying the next 2 nights. Hermanus offers some of the best ‘land based’ whale watching and we have included a 2 hour boat-based whale watching trip – the whales often come in very close to the boat and it is a great experience to see these gentle giants so close. You can also expect to see dolphins, seals and marine birds as well as a great view across Walker Bay with the mountains as a backdrop. Accommodation is at Lavender Manor, located across from Grotto Beach with a sea-view room for you to keep an eye on the whales! Breakfast is included. 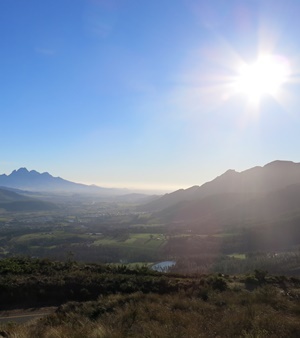 After breakfast take a scenic drive through farming lands to Swellendam. This historical town offers some interesting museums, great local arts and crafts as well as home to the Fairy Sanctuary. Just outside the town is the Bontebok National Park if you want to see some of the wildlife. You will be staying in the historical part of town at owner run HideAway Guest House within strolling distance of great restaurants, on a B&B basis. Travelling along part of the Route 62, through Montagu and the Robertson wine region and heading onto Franschhoek which will be the base for the last 2 nights. You have a short distance so can slowly make your way, stopping en route at some of the wine farms as you go. You will have a full day to visit some of SA’s finest wine farms so make the most of it and we can arrange a driver to take you around. Accommodation is at La Fontaine which is in the village of Franschhoek and easy strolling distance to many great restaurants and shops. Breakfast is included. Sadly your holiday has come to an end, however you can still make the most of the day if you are flying out in the evening. We recommend that you take an easy morning and book lunch at one of the great wine farms to enjoy the last little bit of beautiful surroundings – La Petite Ferme is a favourite! Make your way in the late afternoon back to Cape Town International Airport for your flight back to London.